I don't understand the difference, they both seem the same but I guess they are not. Any examples of when to use one or the other would be appreciated. e.target will be one of the 10 buttons and e.currentTarget will always be the "btns" clip. It's worth noting that if you changed the MouseEvent to a ROLL_OVER or set the property btns.mouseChildren to false, e.target and e.currentTarget will both always be "btns". e.target is what triggers the event dispatcher to trigger and e.currentTarget is what you assigned your listener to. e.currentTarget is always the element the event is actually bound do. e.target is the element the event originated from, so e.target could be a child of e.currentTarget, or e.target could be === e.currentTarget, depending on how your markup is structured. When you click #btn, two event handlers get called and they output what you see in the picture. when you click 'btn', and 'true' and 'true' will be appeared! e.currentTarget would always return the component onto which the event listener is added. On the other hand, e.target can be the component itself or any direct child or grand child or grand-grand-child and so on who received the event. In other words, e.target returns the component which is on top in the Display List hierarchy and must be in the child hierarchy or the component itself. One use can be when you have several Image in Canvas and you want to drag Images inside the component but Canvas. You can add a listener on Canvas and in that listener you can write the following code to make sure that Canvas wouldn't get dragged. e.currentTarget is element with added event listener. 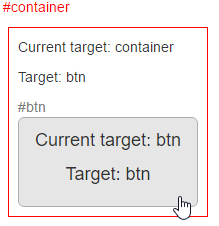 If you click on child element of button, its better to use currentTarget to detect buttons attributes, in CH its sometimes problem to use e.target. currenttarget is the element that the event listener is attached to. e.currentTarget is element(parent) where event is registered, e.target is node(children) where event is pointing to. Not the answer you're looking for? Browse other questions tagged actionscript-3 events event-handling or ask your own question. what is the difference between target and current target in flash.events.event propagation? Why is event target the child if the event is bound to the parent? Jquery get the actual control that fired the event. What is the difference between the mouseover and mouseenter events?